Some people believe that the sole aim of higher education is to make people ready for employment. To what extent do you agree or disagree? Discuss. These quotes clearly show the purpose of higher education. The higher education is needed for the benefit of humanity. They are required to solve the problem that the world is facing like water distress, clean air, food security, disaster reduction, cyber security, etc. and inculcating values like empathy, politeness, stress management, negotiation skills, etc. The sole purpose is to make you a better human being. 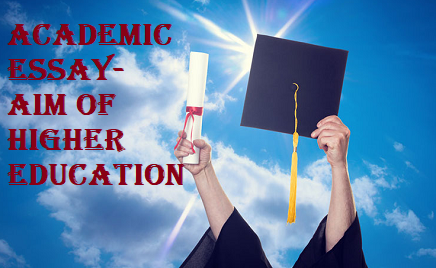 It is true that higher education help in getting a job. But for working in industry people need to acquire skills specific to that industry. Sometimes industries hire people and give customised training to them as per their work need. Suppose you have studied computer engineering in graduation and you have developed interests in artificial intelligence. To pursue this interest, you would like to do MSc or PhD. This interest might bring one day a Eureka moment which may solve the problem of the world. The world is filled with the example where people with genuine interests in their area have brought exceptional results like C V Raman, Homi J Bhabha, Venkataraman Radhakrishnan, and many more. The true purpose of higher education is to do research in your area of interests. It is about finding the solutions to the problem that the world is facing not about getting a job only. The history shows us that sole aim of higher education is not only to make people ready for the employment.